Before you begin, it's important to know which types of apparel are suitable for heat press transfers. Essentially, any item of clothing or apparel in which you can use a hot iron without damaging it is appropriate for a manual heat press transfer. This includes most basic articles of clothing such as t-shirts, sweatshirts, sweatpants, hats, and tank tops. However, it also includes decorative apparel without synthetic materials, such as backpacks, some handbags, and more. There are virtually endless possibilities when it comes to determining which products and types of apparel to perform custom heat press transfers. Once you've selected your garments for custom heat presses, consider whether or not the item is something that is usually washed. If so, it's a good idea to prewash these items in order to achieve a more professional-looking result. If left unwashed, the project may stretch slightly from shrinking around the heat transfer material. Again, this is not necessary for items that aren't washed, like backpacks. 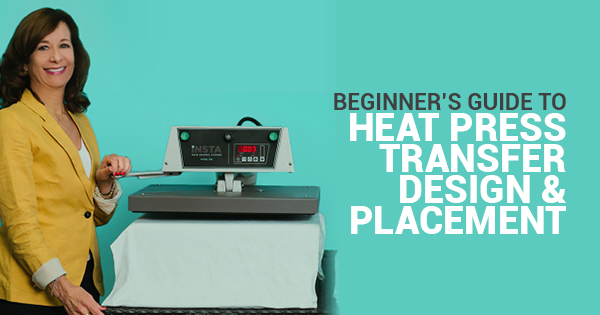 When designing your heat press transfer logo, less is usually more. You don't want a logo or design that's exceptionally busy or hard to discern. Any words or phrases should be kept to a minimum and made easy to read. Most importantly, the nature of a heat press application requires the design to be flipped into a mirror image before ironing. If you skip this step, your design will not come out with the proper orientation. Ultimately, being aware of these heat press transfer preparation and design tips can help you determine which pieces of apparel and logo designs are most effective to promote your business. Keep an eye out for the next post, where we'll discuss some specific placement tips for custom heat press transfers.